SLAVUTICH/CHERNOBYL (26 April 2016) - 'When I got to my house and saw that the city was covered in darkness I realized that life would never be the same again. Pripyat had closed its eyes forever,' says Yelena Ivanova (59) at the commemoration ceremony at the square in Slavutich. 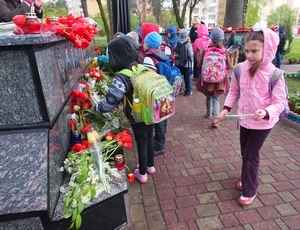 School children lay flowers at the monument for 30 liquidators in Slavutich. The 50 percent discount on the house rent and utilities don't make up for the inconveniences. But she's trying to make the best of life by doing voluntary work. She supports women who have to live without breasts after a breath cancer operation. Ivanova is nostalgic about Pripyat, a city of 45,000 inhabitants which housed the workers of the Chernobyl nuclear plant. During the commemoration ceremony in Slavutich, which was built to replace Pripyat, pictures are shown of Pripyat before the disaster and now, set to dramatic music. The black and white pictures of Pripyat show a lively town with lots of smiling people. The color pictures of the current situation show deserted buildings with trees growing through the roof. The collective pain covers the square like a blanket. Hundreds of people gather at the square to join the ceremony. They put flowers next to the monument with the names and pictures of the thirty likvidatory (liquidators: personnel of the reactors and people who tried to remedy the disaster) who died immediately after the accident and place candles. The ceremony starts at the exact time of the accident. This year the commemoration is at 00.23am instead of 01.23am, due to the switch to summertime. The ceremony itself consists of speeches and songs. Cows graze in the 30km exclusion zone. The explosion in Chernobyl of nuclear reactor No. 4 on the 26th of April in 1986 today still continues to influence the lives of loads of people. According to a new Green cross report, up to 10 million people live in contaminated areas. In Belarus, between 1.6 and 3.7 million people are exposed to radioactive contamination; in Russia the numbers are between 1.8 and 2.7 million people and in Ukraine between 1.1 and 3.5 million people. Most people left, some stayed and a growing group of people returns to their houses in the so called 30km exclusion zone. Which is tricky, because of the general radiation level and the nuclear ‘hot spots’, caused by fallout and all kinds of contaminated debris. Cows graze in the zone and no one knows what happens to the milk and the meat. The food is no longer checked for radiation contamination. The Ukrainians also love mushrooms, particularly known for absorbing radiation. So far there has not been a drop in thyroid cancer cases. Some scientists believe that this has to do with continued food contamination. 'It's a hard life here. Lonely,' says Lydia Masanovitz (79). 'There are little people to communicate with.' 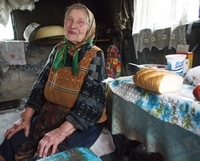 She is one of the eleven inhabitants of Redkovka, a village with 200 mostly empty houses. Seven years after the Chernobyl nuclear disaster in 1986 the 500 inhabitants of Redkovka were relocated due to a continuing high radiation level. Why didn't she go? 'I have built my house together with my husband. They didn't force us to leave. So we stayed here all the time,' Masanovitz says. She receives 50 euros pension a month. With an average income in Ukraine of a few hundred euros a month and a low standard of living that doesn't seem too bad, but the health costs are at her own expense. Her new hip cost her an arm and a leg: 500 euros. On top of that she has to provide for heart medicines herself. She manages because now and then her son and daughter drop by to bring some food and clothes. 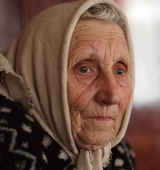 Her children have to drag her away in case her health doesn't allow her any longer to live alone. 'I could live in with one of my children, but I don't want to leave my house,' she says. Her husband passed away two years ago. Hard to say if he led a shorter life due to exposure to radiation. There are a lot of people with cardiovascular disease in the region. His black and white picture is situated on the cabinet. Fresh garlic is healthy, according to Viktor Teremetsky. 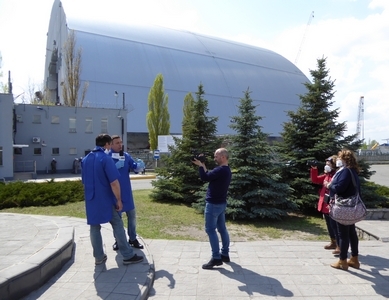 Official tour guide Stanislav Shekstelo explains the decommissioning plan. She regularly goes next door to pray. That's where she sometimes meets the other inhabitants. Together, the villagers turned one of the deserted houses into a sort of church. 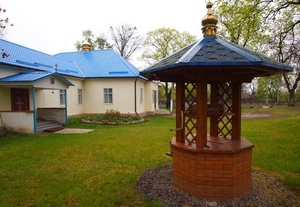 From the outside it is completely renovated and inside it has dozens of icons. It also attracts people from outside Redkovka. The village even houses a magazin, a shop, which is open from 10.00hrs to 15.00hrs. 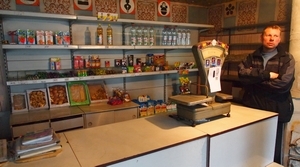 It sells fresh bread every other day and a small selection of sweets and canned food. It is run by 43-year old Igor Dumarchuk. Villager Viktor Teremetsky (67) smells like he hasn't had a bath for years. He asks money for vodka ('It helps to reduce the radiation in my body'). He should go to Kiev to arrange his pension, but lacks the money for the trip. He has a long list of health problems and no medicines to treat them. 'It's nice and quiet out here,' he smiles. 'I have a tractor and cultivate the land a little. My brother is living her as well and my two dogs keep me company. And some people have dachas here,' Teremetsky says. He shows the house of Fiyona Washenok ('I don't remember my age. Maybe 80?'). She is preparing some food in her kitchen, which is a small shed behind her house. She doesn't feel lonely. 'Every three to four days one of my children or grandchildren pays me a visit,' she says. It remains prohibited to live in the 10km zone around the reactor. 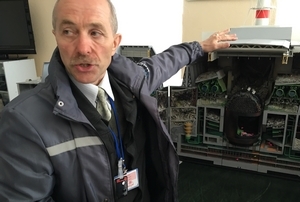 According to Stanislav Shekstelo, official guide at the nuclear plant, the plan is to cut the reactor to pieces and burry them in the 10km zone. 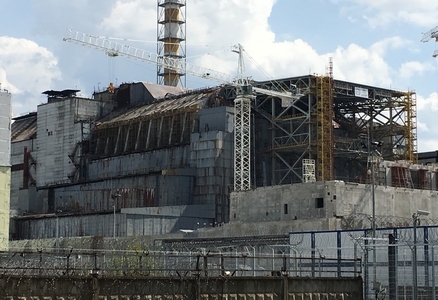 Asked if it isn't better to leave the remains of the building alone, he says that Ukraine is following strict national and international regulations for the decommissioning of the damaged reactor. A recent Green Cross study estimates the cost of the disaster at nearly 624 billion euros in direct and indirect costs over the last 30 years. The direct costs are the damage to the power plant itself and to its environment, the loss of goods and the immediate effects on health. Indirect costs include the withdrawal from the contaminated area and the consequences of the stigmatization of adults and children who were exposed to radiation. Although it is hard to calculate the effects of stigmatization, the report gives an indication of the huge financial consequences of the accident. The construction of a 109m high sarcophagus - costs around 1.5 billion euros - is scheduled to be completed by the end of the year. The arch will cover reactor No. 4, buying 100 years of time to find a way to get rid of it in a proper way. The dismantling process poses some major challenges due to a radiation level of approximately 1,500 Rem per hour inside the reactor - a dose of 8 Sievert (Sv) is lethal and 1 Sv equals 100 Rem. Some 200 tons of nuclear fuel is still inside. 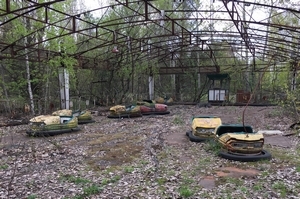 Well known image of deserted lunapark in Pripyat. Ironically, the accident provides the region with work. For decades to come around 2,500 people will work on removing the core, removing the nuclear fuel, dismantling reactors No. 1, 2 and 3, and building a storage for nuclear waste. Tanya Timoshenko (36), technical supervisor, considers it an honor to work on the decommissioning project. 'If we don't do it, who else does?' Her husband also works at the plant on a 2-3 day rotation basis. 'Due to the working schedule we have a lot of time left for sport. And we love sports,' she says. She says she doesn't like her job. 'But through my work I contribute to knowledge about nuclear energy,' Timoshenko concludes. A retired couple says workers and liquidators are treated in a better way in Russia and Belarus than in Ukraine. They think the pension fee of less than 180 euros a month is a laugh. 'I worked in the contaminated area. I collected the clothes of the workers. Of course I have been exposed to a lot of radiation. 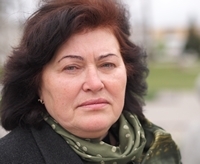 And now I have to pay taxes over my pension and provide for health expenses myself,' says Lubov Petrushkin (61). She wrote a song about the accident. 'The disaster brought us three 'colors': sorrow, death and heroism.' She starts singing the complete song, which moves the translator so much that she bursts into crying. 'There is no future perspective here,' her husband Vitaly Petrushkin (61) says. 'Once the sarcophagus is finished they only need 900 people at the plant. 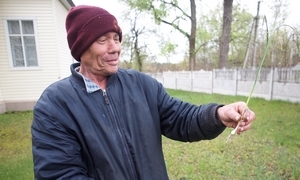 Slavutich was built to replace Pripyat, but soon Slavutich will die too,' he says. All of their four kids live and work abroad. Anatoly Timoshenko (56), enjoying early retirement, doesn't agree. 'I've been to Europe and I've seen all the windmills. Wouldn't it be a great opportunity for this region to invest in windmills and solar energy? I would be willing to invest my own money in such a plan,' he says. Reactor No. 4 in the current state; Italian television crew in front of the 109m high sarcophagus. The Chernobyl disaster at 01.23hrs on 26 April 1986 was the worst nuclear power plant accident in history in terms of cost and casualties. During the accident itself, 31 people died, and long-term effects such as cancers are still being investigated. The disaster began during a systems test at reactor number four of the Chernobyl plant. There was an unexpected power surge, and when an emergency shutdown was attempted, a much larger spike in power output occurred, which led to a reactor vessel rupture and a series of steam explosions. These events exposed the graphite moderator of the reactor to air, causing it to ignite. The resulting fire sent a plume of highly radioactive fallout into the atmosphere. The plume drifted over large parts of the western Soviet Union and Europe. The fallout reached the Netherlands on 2 May. A grazing ban was announced to avoid contamination through the consumption of milk. Selling leafy vegetables that just had been harvested was prohibited.